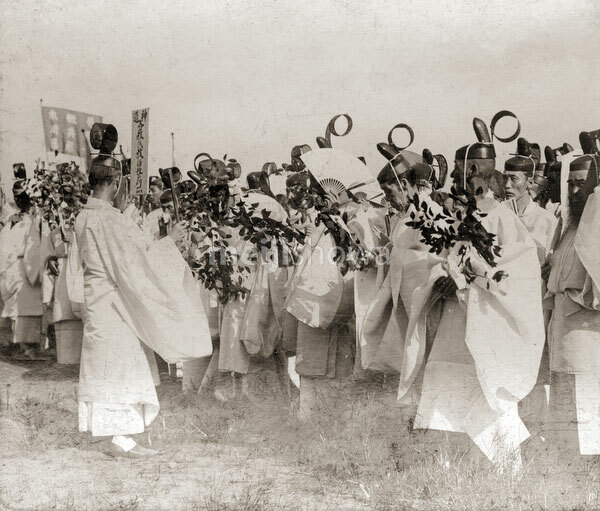 White clothed Shinto priests participate in a funeral procession in Tokyo for the casualties of the sunk troopship Hitachi Maru (常陸丸). It was sunk by the Russian cruiser Gromoboy in the Tsushima Strait on June 15, 1904 (Meiji 37) during the Russo-Japanese War (1904-1905). Of over 1,000 men, only 152 were rescued. The commander of the Japanese troops on the ship destroyed his flag before committing suicide, an action followed by his officers.